Tsetse-transmitted trypanosomosis (nagana) has been the cause of stock losses in the recent past and still presents a major problem to livestock owners in certain areas of KwaZulu-Natal, South Africa. Over 10 000 cattle mortalities were reported in the 1990 nagana outbreak. Although information on the distribution and abundance of the tsetse flies Glossina brevipalpis and Glossina austeni in KwaZulu-Natal exists, data on their vector competence are lacking. This study aimed to determine the rate of natural Trypanosoma congolense infection by field-collected as well as colony-reared flies of these species. 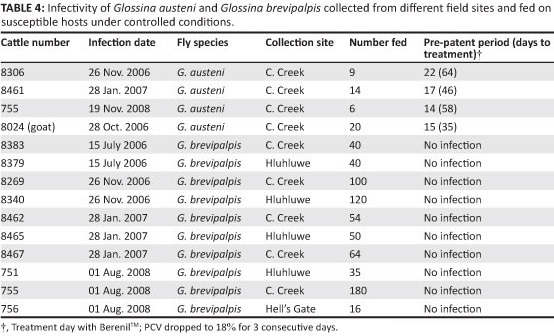 A total of 442 field-collected G. brevipalpis and 40 G. austeni flies were dissected immediately after collection to determine their infection rates, whilst 699 G. brevipalpis and 49 G. austeni flies were fed on susceptible animals in 10 and four batches, respectively, for use in xenodiagnosis experiments. Teneral colony flies were fed on infected animals and dissected 21 days post infection to confirm their infectivity testing. Glossina austeni harboured 8% immature and mature infections. In G. brevipalpis, the infection with the immature stages was lower (1%) and no mature infections were observed. Although all four batches of G. austeni transmitted T. congolense to four susceptible animals, no transmission resulted from 10 batches of G. brevipalpis fed on susceptible cattle. Colonyderived G. austeni (534) and G. brevipalpis (882) were fed on four bovines infected with different T. congolense isolates. Both G. austeni and G. brevipalpis acquired trypanosome infection from the bovines, with immature infection ranges of 20% - 33% and 1% - 4%, respectively. Parasites, however, only matured in G. austeni (average = 4%). Glossina austeni plays a larger role in the epidemiology of animal trypanosomosis in KwaZulu-Natal than G. brevipalpis and therefore more focus should be aimed at the former when control measures are implemented. The tsetse zone in South Africa encompasses an area of 18 000 km2, representing the southernmost distributional limit of this genus in Africa (Kappmeier-Green, Potgieter & Vreysen 2007). Of the four tsetse species (Diptera: Glossinidae) historically found in South Africa, only Glossina austeni (savanna species) and Glossina brevipalpis (fusca species) still exists in the north-eastern parts of KwaZulu-Natal. The fly habitat is confined to protected nature reserves, game parks, indigenous forests and river beds (Kappmeier, Nevill & Bagnall 1998). The other two species, namely Glossina morsitans morsitans and Glossina pallidipes, which were considered to be the most efficient vectors of trypanosomes in general, had been eradicated in 1897 and 1954, respectively (Du Toit 1954). Glossina austeni and G. brevipalpis were not considered to be important vectors of trypanosomosis in South Africa (Fuller 1923). Despite the eradication of G. morsitans morsitans and G. pallidipes, clinical cases of trypanosomosis were still diagnosed in cattle, horses and dogs between 1955 and 1989 (Bagnall 1993). In 1990, a serious outbreak of the disease in cattle, locally referred to as nagana, was reported at dip tanks in the vicinity of the Hluhluwe-Umfolozi Game Reserve and the infection was attributed to Trypanosoma congolense and Trypanosoma vivax. The treatment of cattle with trypanocidal drugs, combined with tsetse control efforts using deltamethrin 'pour-on' insecticide and odour-baited, insecticide-impregnated targets, was successful in controlling the outbreak (Bagnall 1993), but the strategy was considered unsustainable because preventing tsetse fly reinvasion could not be guaranteed (Kappmeier et al. 1998). The temporary nature of this approach was evidenced by the recurrence of trypanosomosis, which has reverted to the high levels seen in 1990, before these temporary control measures were instituted (Van den Bossche et al. 2006). The reoccurrence of outbreaks changed the previous perception that G. austeni and G. brevipalpis were of minor importance in trypanosome transmission and reaffirmed that they are responsible for the cyclical transmission of nagana (Kappmeier & Nevill 1999; Kappmeier-Green et al. 2007). Subsequent tsetse surveys conducted from 1991 to 1999 revealed a relative higher prevalence and abundance of G. brevipalpis compared with that of G. austeni in the affected areas (Bagnall 1993; Kappmeier 2000). Recently, a study conducted at the Mvutshini dip tank found trypanosome infections in 61% of suspected sick cattle using the buffy coat procedure (Van den Bossche et al. 2006). The survey indicated that nagana was still prevalent in KwaZulu-Natal and that T. congolense was the dominant causative organism. Of the two tsetse species, G. brevipalpis was found to be more abundant and therefore believed to be responsible for causing disease in cattle around the Hluhluwe-Umfolozi Game Reserve. The importance of a species as a vector is not determined only by its abundance, but also by its vector competence; that is, its ability to become infected and transmit pathogens (Leak 1998). There are two key stages in the interaction of some trypanosomes (e.g. Trypanosoma brucei or T. congolense) with tsetse flies, namely the initial establishment of infection in the midgut and the subsequent maturation of the trypanosomes to produce infective stages in the salivary glands or oesophagus (Aksoy, Gibson & Lehane 2003). The current study was therefore conducted to identify the principle vector of trypanosomes in both field and controlled experimental conditions by comparing the vector competence of G. austeni and G. brevipalpis in transmitting T. congolense to cattle. Glossina brevipalpis and G. austeni were collected between 2006 and 2008 from areas known to be endemic with nagana in north-eastern KwaZulu-Natal (Figure 1). Flies were collected using the H-trap designed for collecting these two species (Kappmeier 2000). Traps were baited with a mixture of 1-octen-3-ol and 4-methylphenol, dispensed from heat-sealed sachets in the presence of acetone. The traps were emptied daily and flies were transported to the Agricultural Research Council (ARC) Field Research Station at Kuleni in a cooler box. Collected flies were divided into two groups, of which one was immediately used to determine the infection rate and the other group was used in xenodiagnosis experiments. Flies were couriered to the ARC-Onderstepoort Veterinary Institute (OVI) laboratory, situated 600 km from the collection areas. A total of 442 G. brevipalpis and 40 G. austeni specimens were dissected immediately after collection and examined for trypanosome infections. An additional 195 G. brevipalpis specimens were dissected after transmission experiments to confirm the results of the infectivity testing in cattle. Dissections were conducted according to the method of Lloyd and Johnson (1924) and as described by Leak, Ejigu and Vreysen (2008). Flies were dissected to expose immature infections (non-infective trypanosome forms) in the midgut and mature infections (infective trypanosome forms) in the proboscis (Jordan 1976; Van den Bossche et al. 2004). The respective organs were placed onto microscope slides containing droplets of phosphate-buffered saline (with glucose) and covered with cover slips. Infection rates were determined by direct observation of prepared slides under a compound microscope using a 10x eyepiece and a 25x objective. At the ARC-OVI, field-captured flies were maintained under the same conditions as the colony-reared flies. The ARC-OVI houses well-established colonies of G. austeni and G. brevipalpis. These colonies were established in 2002 with seed materials of G. austeni obtained from the Tsetse and Trypanosomosis Research Institute in Tanga, Tanzania and G. brevipalpis supplied by the Insect Pest Control Sub-Programme of the International Atomic Energy Agency (IAEA) laboratories in Seibersdorf, Austria. Colony flies were maintained at 75% relative humidity and 24 °C and fed on artificial membranes using high-quality gamma-irradiated bovine blood according to the standard operating procedure of the Food and Agriculture Organization/IAEA (2006). The artificial infection of colony flies was carried out to compare the results with the infection rate in field-collected flies. Each of four susceptible cattle was infected intravenously with (1 x 106) organisms using four different T. congolense isolates. Three of the isolates (I, II and BmrngK2) were isolated from cattle at Boomerang Farm and the fourth (MVU10) from cattle at the Mvutshini community dip tank. All isolates were maintained in mice. Molecular characterisation of all four isolates, according to a method described by Geysen, Delespaux and Geerts (2003), revealed that they belonged to T. congolense. The infected cattle were monitored daily for the development of trypanosome parasitaemia and fever, whilst packed cell volume (PCV) values were also determined. Flies were fed on cattle when parasites were detected in the buffy coat preparations. Experimental animals were clipped on their flanks and localised areas shaved with a scalpel blade to expose the skin (Akol & Murray 1983). Flies were confined in cages in groups of not more than 20 and allowed to feed until fully engorged. The engorged flies were maintained on artificial feeding membranes (as described for the colony flies) for 21 days before dissection (Masumu et al. 2006). To demonstrate the infectivity of field-collected flies in cattle, 10 batches of G. brevipalpis (699 flies in total) and four batches of G. austeni (49 flies in total) were used in the transmission experiments. The batch sizes were determined by the number of flies captured in an area on a specific date. For each area the number of collections ranged from 16 to 180 and 6 to 40 for G. brevipalpis and G. austeni, respectively. Flies were fed as mentioned earlier. Where the number of flies per batch exceeded 20, more cages were used. Each batch was allowed to feed on a susceptible Nguni bovine, except for one batch of G. austeni, which was fed on a goat. The animals were monitored daily for the development of trypanosome parasitaemia, fever and changes in PCV over 30 days. Animals considered anaemic (i.e. PCV = 18% for three consecutive days) received treatment with 3.5 mg/kg diminazene aceturate (Berenil TM). Variation in infection prevalence between isolates and tsetse flies was analysed using the statistical program GenStat® (Payne et al. 2007). Testing was performed at the 5% significance level, with p < 0.05 used as the cut-off for statistical significance. Ethical approval for the experiments was obtained from the Animal Ethics Committee of the OVI (ref. 07/20/C174) and Animal Use and Care Committee of the University of Pretoria, Faculty of Veterinary Sciences (ref. VO56-09). A total of 637 G. brevipalpis and 40 G. austeni specimens collected from the field were dissected and their infection prevalence assessed (Table 1). 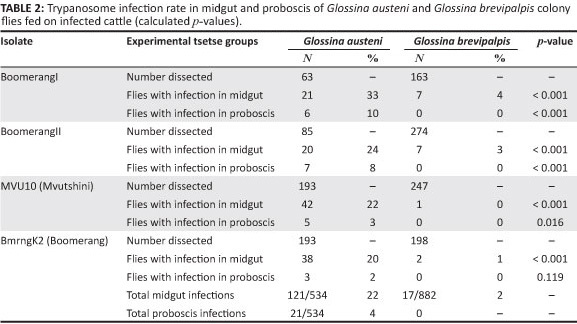 Analysis revealed 8% immature and mature trypanosome infections the midgut and proboscis of G. austeni. On the other hand, only 1% of immature infections were detected in the midgut of G. brevipalpis. To confirm the infection rate results obtained for the field-collected tsetse flies, laboratory-controlled fly infectivity experiments were conducted. A total of 534 colony-reared G. austeni and 882 G. brevipalpis, fed on experimentally infected parasitaemic cattle, were dissected. Dissection results indicated that all four isolates (BoomerangI, BoomerangII, BmrngK2 and MVU10) became established in the midgut of both G. austeni (20% - 33%) and G. brevipalpis (1% - 4%) (Table 2). Of the infected flies, 22% (n = 121) immature infections and 4% (n = 21) mature infections were found in G. austeni fed on four cattle infected with different T. congolense isolates. Only 2% (n = 17) immature infections were seen in G. brevipalpis and no parasites were detected in the proboscis. Vector competence was also assessed to confirm the results on the infection rates with trypanosomes in G. brevipalpis and G. austeni collected from game parks and communal dip tanks in KwaZulu-Natal. The infectivity of G. brevipalpis fed on susceptible cattle under controlled conditions was not shown and no trypanosome transmission was observed from any of the flies (as many as 180 per animal). On the other hand, transmission with G. austeni was achieved with a small number of feeding flies (i.e. fewer than 10 per animal). There were no significant differences in the immature infection prevalence between the four isolates in G. austeni (p = 0.158). However, there was a significant difference (p = 0.025) in the immature infection prevalence of these isolates in G. brevipalpis. A higher number of midgut infections were observed to have resulted from BoomerangI and II (4.3% and 2.6%, respectively) than from MVU10 and BmrngK2 (0.36% and 0.50%, respectively), as shown in Table 3. In contrast, the number of G. austeni with mature infections from the four isolates differed significantly (p = 0.007). Flies infected with BoomerangI and II isolates had a higher infection prevalence (9.5% and 8.2%, respectively) compared with those infected with isolates MVU10 and BmrngK2 (2.6% and 1.6%, respectively) (Table 3). Mature infections were not detected in the proboscis of any G. brevipalpis flies. After the flies had fed on the animals, parasites were detected in blood samples within 14, 17 and 22 days for cattle and 15 days for the goat. All animals subsequently presented with clinical signs of anaemia (Table 4). In the present study, only 1% of T. congolense infections were found in the midgut of G. brevipalpis. In contrast, the infection rate in the midgut and the proboscis of G. austeni was significantly higher, with 8% detected in both organs. The age structure of the two Glossina species had not been determined in the field-collected flies. It has been reported that older flies are more likely to be infected than younger flies (Harley 1966; Jordan 1976; Woolhouse et al. 1994). The factors affecting the trypanosome infection rate in flies and contributing to their being refractory to infection have been detailed and discussed by several authors (Jordan 1976; Roditi & Lehane 2008; Welburn & Maudlin 1999). Factors such as age may influence the readiness with which flies can be infected. According to Harley (1967), the longer the female of some fly species, such as G. brevipalpis, lives, the more likely she is to be infected with T. congolense. In contrast, species such as G. austeni can be readily infected when they are 1 day old and less successfully later (Jordan 1976; Ward 1968). In our study, both G. austeni and G. brevipalpis colony specimens were fed a day after emergence and were able to establish infections in the midgut. However, trypanosomes could not develop to maturity in G. brevipalpis. 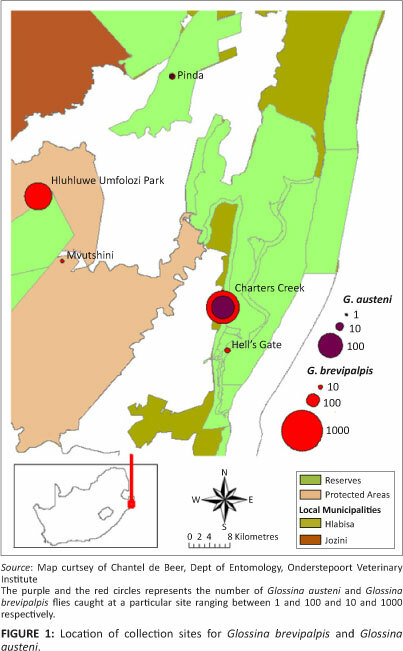 The results showing the poor efficiency of G. brevipalpis as a vector was unexpected based on their higher population densities in areas close to the Hluhluwe-Umfolozi Game Reserve where high infection prevalence in cattle had been reported (Gillingwater, Mamabolo & Majiwa 2010; Van den Bossche et al. 2006). These results further suggest that G. austeni is the major vector of trypanosomes in the area, despite its relatively low population density as reported by Esterhuizen et al. (2005) and Hendrickx et al. (2003). The relatively low numbers of G. austeni collected in this study indicate either that the natural population density is low or that the H-trap is not effective for the collection of this species. Similar observations were reported by Gaturaga, Maloo and Loehr (1989) when they collected only 33 flies representing two Glossina species over a period of one year, despite a high trypanosome infection rate (22%) amongst cattle. They attributed the low numbers of G. austeni collected, assumed to be the major vector, to the inefficiency of the biconical trap used. Interestingly, flies infected with isolates BoomerangI and II exhibited more midgut infections in G. brevipalpis and more mature infections in G. austeni than those infected with isolates MVU10 and BmrngK2. Both fly species seemed to be more susceptible to infection with Boomerang I and II isolates; however, G. brevipalpis is refractory to subsequent parasite maturation occurring in the proboscis. Goossens et al. (2006) found a very low prevalence of T. congolense in cattle (0.8%) on Mafia Island, Tanzania, where G. brevipalpis is the only tsetse fly species encountered and widely distributed. They attributed the low prevalence to a combination of factors, such as frequent use of prophylactic treatment of cattle with trypanocidal drugs, a low feeding frequency of G. brevipalpis on cattle and the low vectorial capacity of the fly. In contrast, Wilson, Dar and Paris (1972) found the infection rate with T. congolense in field-collected G. brevipalpis to be about 2% in their study in Uganda. The injection of the infected proboscis collected from these flies produced patent infection in mice and thus demonstrated the ability of T. congolense to mature in the proboscis. The present data do not support results from two recent studies on the trypanosomes infection rates in tsetse flies conducted in the same area using only polymerase chain reaction (PCR) analysis (Gillingwater et al. 2010; Mamabolo et al. 2009). Mamabolo et al. (2009) detected trypanosome DNA in 89% of the flies examined but the results did not specify the species origin. Furthermore, this molecular test does not distinguish between mature and immature infections. In the study of Mamabolo et al. (2009), the injection of a suspension of macerated fly proboscis did not produce any viable infections in mice that were monitored for the development of trypanosome parasitaemia. Similarly, Gillingwater et al. (2010) reported a higher percentage (20%) of flies testing positive for trypanosome DNA in the midgut with only 1.6% of mature infections. Again, the results were not separated according to species. The higher infection rates detected by the PCR analysis may be related to recent feeding of the flies on infected animals although these trypanosomes would not necessarily develop successfully in the midgut or the proboscis. A wealth of entomological data have been collected over the years in KwaZulu-Natal, which were used by Hendrickx et al. (2003) to produce distribution and prediction maps. However, parallel data on the epidemiology of the disease have not been generated to support the intention of the veterinary authorities to control or eradicate tsetse flies from South Africa. The results from the current study support the findings of Goossens et al. (2006) that G. brevipalpis is not the main vector of T. congolense in KwaZulu-Natal, despite its higher abundance, whereas G. austeni has been shown to have a higher vector competence. Focus should, therefore, be directed towards the control of G. austeni in the province whilst more research is still needed to develop more efficient traps to monitor the population dynamics of this species before, during and after control operations. The Department of Science and Technology and the ARC are thanked for financial support Dr Gert Venter provided valuable comment on an earlier version of the manuscript. Mr Dannie de Klerk assisted with field collections and feeding on susceptible animals. Mr Jerome Ntshangase and Mr Gazu are thanked for deploying, and maintaining traps and assistance with field collections. M.M. (ARC-Onderstepoort Veterinary Institute) was the project leader and performed most of the experiments and wrote the manuscript. J.M. (Universite Pedagogique Nationale) was a student mentor who assisted in the execution of some experiments and also edited the manuscript. A.L. (ARC-Onderstepoort Veterinary Institute) was the project supervisor and also contributed to revision and editing of the manuscript. B.M. (ARC-Onderstepoort Veterinary Institute) was the co-supervisor of the study and contributed to revision and editing of the manuscript. P.v.d.B. (Institute of Tropical Medicine) was a co-supervisor to J.M. (Universite Pedagogique Nationale) with regard to providing mentorship and assistance with specific experiments.